JESSE AND GIGI, A FIVE MONTH-OLD GOLDEN RETRIEVER -- Jesse is in prison for manslaughter in the first degree. He has served 10 years. JESSE: "I have gotten a lot - a sense of responsibility, love, compassion for living things. I have always loved dogs but this is bigger. This allowed me to re-awaken who I am and got me back in touch with my feelings. 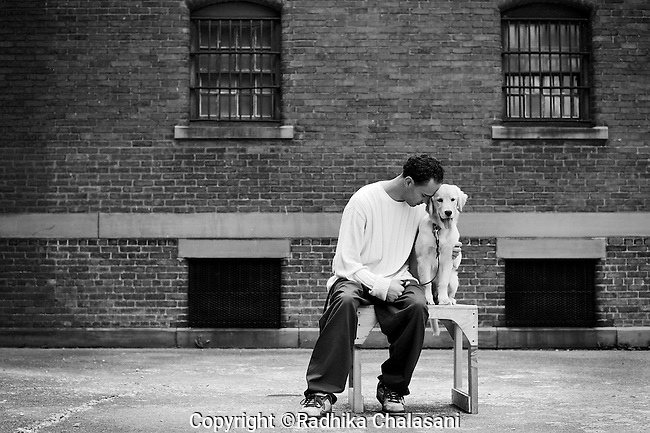 "..The Puppies Behind Bars (PPB) Program works with prison inmates in New York, New Jersey, and Connecticut to train service dogs, including ones who help injured soldiers. The puppies arrive at 8 weeks-old and remain at the prisons, mostly working with one inmate, for 20 months. Fishkill Correctional Facility is a medium security prison in New York with 22 men in the puppy program. The emotional element of caring for the puppies breaks down the hard façade that most prisoners create for themselves to survive prison life. Prisoners learn responsibility and pride in helping others. The program often gives them a new outlook on their crimes, their time in prison, and goals when they are released. ..